MANILA, Philippines – LET RESULT. The Professional Regulation Commission (PRC) released the full results of Licensure Examination for Teachers (LET) or teachers board exam administered on March 25, 2018 (Sunday) in at least 20 testing locations nationwide. PRC and the Board for Professional Teachers (BPT) listed on May 23, the newly licensed professional teachers for secondary level after the grueling two (2) months of waiting the result. 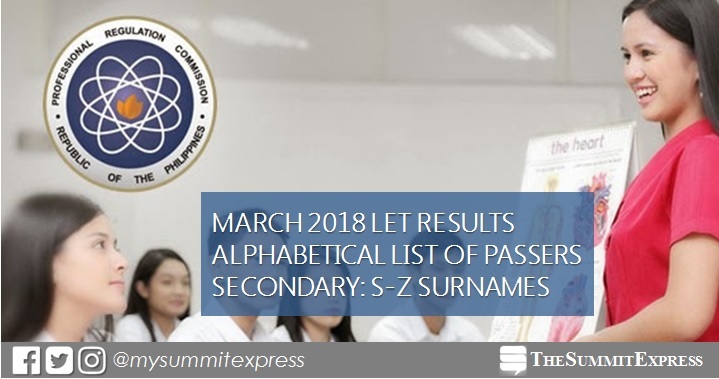 The complete list of passers for Secondary exam, S-Z surnames, is available online very soon. PRC Resolution No. 2017-1068 stated that LET results for the first teachers board exam this year will be on Tuesday, May 22, 2018. Recent posts of reliable souce Dr. Carl Balita, the owner of leading review center for various professional exams, hinted that LET results may be released on May 23. "When the sum of the day equals with the month, God will LET DREAM and the DREAMER be ONE." This can be equated to May 23 (2+3=5, 5 is the 5th month of the calendar). Congratulations to all LET passers!